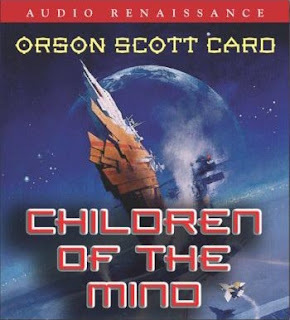 Other than Ender's Game, this is my favorite of the Orson Scott Card books that I've read. Of course, that would be like saying that Return of the King is the best of Tolkien's books - neither book stands alone and is only great because of the earlier books in the series that build up for it. This book is a lot of fun though. It neatly wraps up the Ender story, it deals mostly with the death or survival of one of my favorite characters (Jane), and keeps going with the nature of the soul and faster than light travel and all that that is developed in Xenocide. Still, remember the frog in hot water analogy - in Ender's game it all seems pretty normal - not a far stretch. By the time you get done with this book, you'll have swallowed a romantic storyline involving a guy who is simultanesouly in love with a disembodied genderless soul existing in the computer network and a soul-less woman body operated from a distance by a man's soul--yeah, it's wacko, but somehow it seems not so wacko in the storyline. Makes me laugh, but somehow Card pulls it off and makes it quite interesting and entertaining. The audio production is great - adds to the story nicely, making this a great audiobook.